Just don't except any surprises. Whether it's based on a modified version of a platform shared with VW or not, Vince, you really should learn what "platform sharing" means if you are going to discuss it. 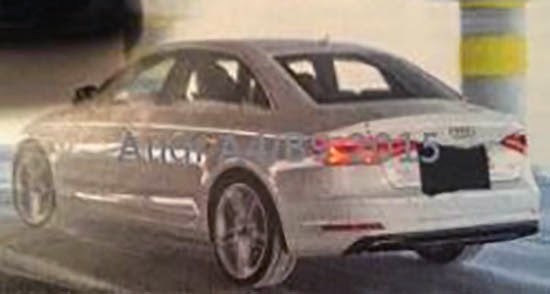 It does not mean that the new A4 will resemble a VW at all. Every automaker does it, yet you love to call it out with Audi. As stated already, this is not using the MQB platform. The MLB platform used on the next A4 will be the basis for larger VW, Audi and Porsche models. Honestly Vince, I've read this blog for at least a decade. These inaccuracies, typos and juvenile biases are lame. All of the other blogs are evolving. You really need to start getting more professional. I would like to continue to check your blog but the fact that you have numerous typos per entry drives me absolutely crazy. An uptick in drama: notice rounded trunk lid joining subtle curve of rear window and arched top of rear fascia. Plus larger, more shapely and more colorful tail lights.